A half-eaten shark washed ashore Saturday on New Smyrna Beach in Florida, and everyone appears to have the same question: What ate it? 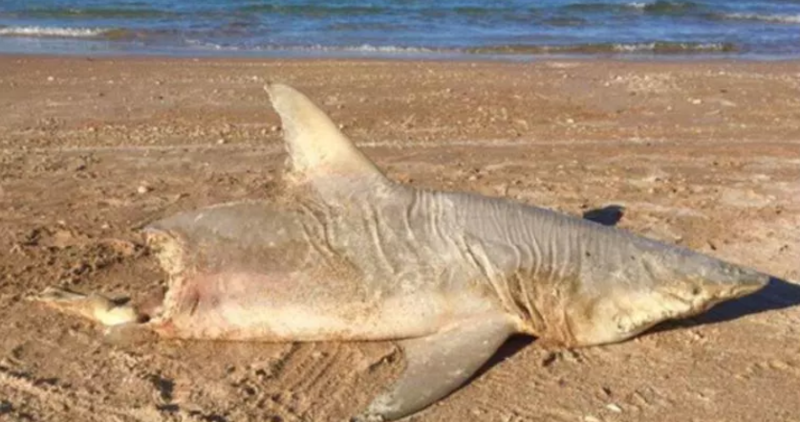 Photos of the estimated 5-foot-long shark quickly spread throughout social media over the weekend after a Volusia County Beach Safety Ocean Rescue lifeguard posted a picture of the dead shark. “Anyone up for a swim? LOL I guess there is something even bigger out there. #blacktip #whereiskatherine,” the lifeguard tweeted. Beach Safety spokeswoman Tammy Morris told CBS affiliate WKMG the shark was either a blacktip or a spinner shark. She said the shark was likely attacked by a bigger fish. “It is unknown what type of predator bit the shark or how far offshore it was when it was attacked,” Morris told the station. But some locals have their own theories. Nick Oulette, from Eustis, is a frequent visitor of the beach who often spends weekends fishing with friends. The 23-year-old said he spotted the tailless shark on Sunday afternoon near the dock. Others turned their suspicions on Katherine, a 14-foot great white shark that was tagged with a satellite tracking device and can be tracked by Ocearch. The giant shark was spotted off the Florida coast in January. “Katherine’s snack?” one Twitter user asked. “Could this be the work of Katherine?” another pondered. Florida Fish and Wildlife Conservation Commission officials tweeted Monday that another great white shark was spotted about 20 miles off Ormond Beach on Feb. 1. Morris said though they may never know what attacked the shark, officials will certainly continue to keep an eye out.